The fifth international Every Child Deserves a Family forum, this year entitled “Every Child Deserves a Family: Yesterday, Today, Tomorrow”, took place in Moscow between 24 and 27 October. 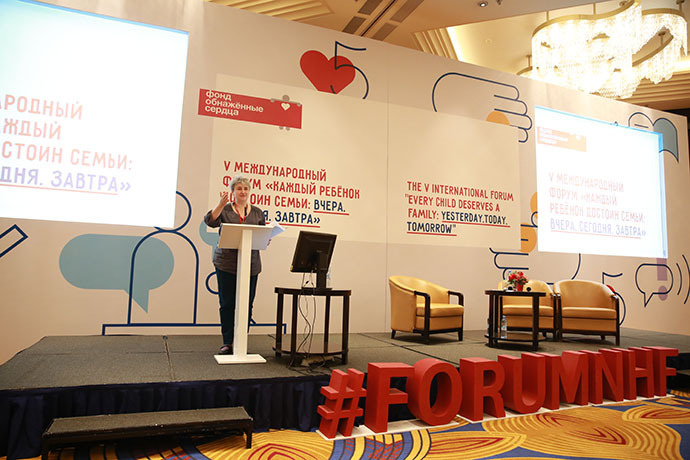 The forum is organised on an annual basis by the Naked Heart Foundation for leading child development experts from Russia and beyond and specialists from NGOs that support families of children with special needs and foster families. Foster parents and parents of children with conditions such as autism, Down’s syndrome, cerebral palsy and learning disabilities made up half of the audience this year. This fifth anniversary forum focused on the event’s major achievements over the past five years, as well as plans for the future. 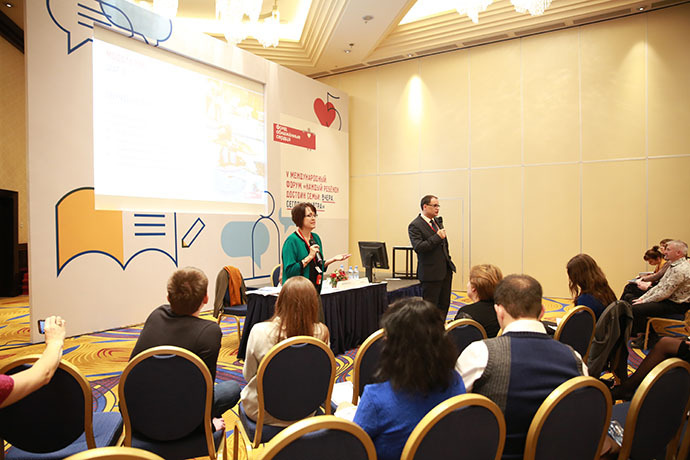 Four days of lectures, seminars and master classes were held in the conference halls of the Renaissance Moscow Monarch Centre Hotel, where participants learned about best practices relating to the provision of support to families of children with special needs and foster families, the use of new technologies in the field of inclusive education, the effective implementation by regional NGOs of knowledge gained at the forum and prospects for the development of a professional community in Russia. The forum was attended by more than 700 people, including 120 speakers from Russia, Georgia, Belarus, the USA and the UK. You can read more about the speakers here. 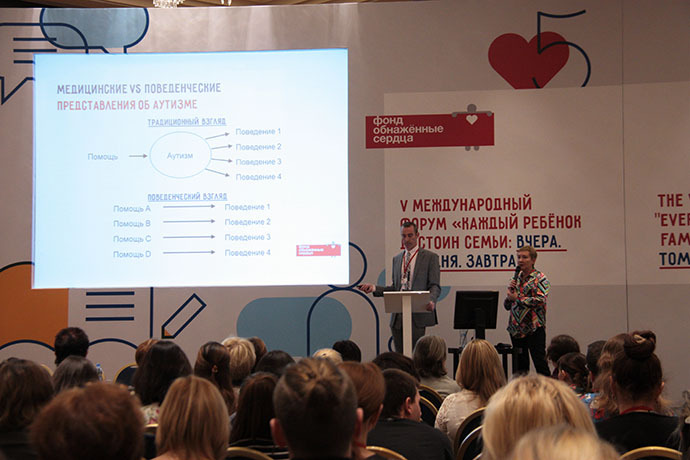 Asya Zalogina, President of the Naked Heart Foundation: “We are delighted that the number of international specialists giving presentations about up-to-date, proven scientific practices is increasing year on year. The event’s audience is constantly expanding, giving specialists from regional NGOs and parents from all corners of our large country the opportunity to get together for a few days and have a professional discussion about existing challenges and the latest developments in the fields of child development and legislation concerning people with special needs and their families”. The topics covered this year in the presentations and master classes included: recent experience of the use of proven support programmes for children with autism spectrum disorders (ASD); programmes to support the parents of children with ASD – experience of the EarlyBird programme under Naked Heart projects; the development of an education system for children with special needs and the contribution of NGOs; and pressing issues relating to the application of and amendments to legislation in the social sector – for the first time in the history of the forum a special session was be devoted to this topic on a daily basis. This year’s forum speakers included: Dana Johnson, professor in the faculty of neonatology and paediatrics at the University of Minnesota; Kathleen Taylor, occupational therapist at the Center for Development and Disability, University of New Mexico; Marsha Stepensky, certified behavioural analyst and special education teacher at the Sulam School, Rockville; Dr Thomas Higbee, professor of special education and rehabilitation at Utah State University and director of the ASSERT support service; and other specialists from Russia and beyond. Also presenting was Ivan Bakaidov, developer of a programme that helps people with speech difficulties to communicate. Some of the most well respected Russian child development specialists acted as moderators for the workshops, and conducted a substantial part of the forum. Among them were: director of Moscow’s Centre for Curative Pedagogics Anna Bitova; director of Perspektivy charity Maria Ostrovskaya; head of the Pro-Mama Centre Maria Ternovskaya; child neurologist Svyatoslav Dovbnya and clinical psychologist Tatiana Morozova, who are both Naked Heart Foundation experts; and teacher, head of the legal panel and chairman of the board at the Centre for Curative Pedagogics Roman Dimenstein. All the experts, including those from overseas, travelled to Moscow and spoke at the event on a completely pro-bono basis, at the invitation of the Naked Heart Foundation.